Not everyone – man or woman – with noteworthy accomplishments gets credit for those achievements, however remarkable they may be. Therefore, I’ve chosen to blog each week in March about lesser-known women who have made a mark on history. Phillis was born in West Africa (probably present day Gambia or Senegal) and sold into slavery at the age of about seven. Rather than being sent to either the West Indies or Southern colonies for hard labor in the fields, she ended up with slaves sent to Boston because of age and/or frailty. She was purchased at the Boston docks by the family of John Wheatley, who was either a prominent merchant or tailor (or both), for a pittance because the captain of the slave ship thought the girl was ill and about to die. The family named her Phillis, after the ship that brought her from Africa. It didn’t take long for the Wheatley family to discover what a prodigy she was. John Wheatley, a progressive thinker, recognized her unique talent and supported Phyllis's education. She was released from some of her household duties to study with the Wheatley’s 18-year-old daughter Mary and their son, Nathanial. Within a year and a half she was reading the Bible, Greek and Latin classics and British literature. She also received education in other subjects such as geography, mathematics, and astronomy. By the age of twelve, she was writing poetry about hope, freedom and morality, which her owner John Wheatley showed off to many of his friends in high places. He also allowed her to focus on her education instead of housework. Phillis sent her first poem to the University of Cambridge-New England, Entitled “On Messers Hussey and Coffin.” In 1767, the poem was published in the Newport Rhode Island newspaper Mercury, stirring up a lot of discussion and establishing her as the first African-American to be published. Publication of her poem “An Elegiac Poem, on the Death of the Celebrated Divine George Whitefield” in pamphlet form in 1770 by Russell and Boyles, Boston, reached Boston, Newport, and Philadelphia, and appeared alongside the funeral sermon for Whitefield in London. The poem, written in heroic couplets, describes Whitefield as bringing the voice and knowledge of God and Jesus to the Americas. Even at the age of seventeen, the poet’s spiritual language incorporates themes of inclusion and equality. Thy wonted auditories cease to throng." Her reputation not-with-standing, when Wheatley tried to publish her book of poetry, people questioned that an African slave could write poetry, and she had to defend her authorship in court in 1772. She won the case, and John Wheatley convinced some of Boston’s most respected men, including the governor and John Hancock, to review the work and vouch for the poems’ authenticity. ​Even with that, American publishers wouldn't publish her book of poetry. The next year, in 1773 (age 20), she traveled with Nathaniel Wheatley to London where chances of publication were better. She was introduced to high society, and they were quite enthusiastic about her work. Despite the distinguished endorsements, it wasn’t printed in America until 1786, after the author’s death. It was popular enough that during the remainder of the 1700’s, there were an additional seven editions. 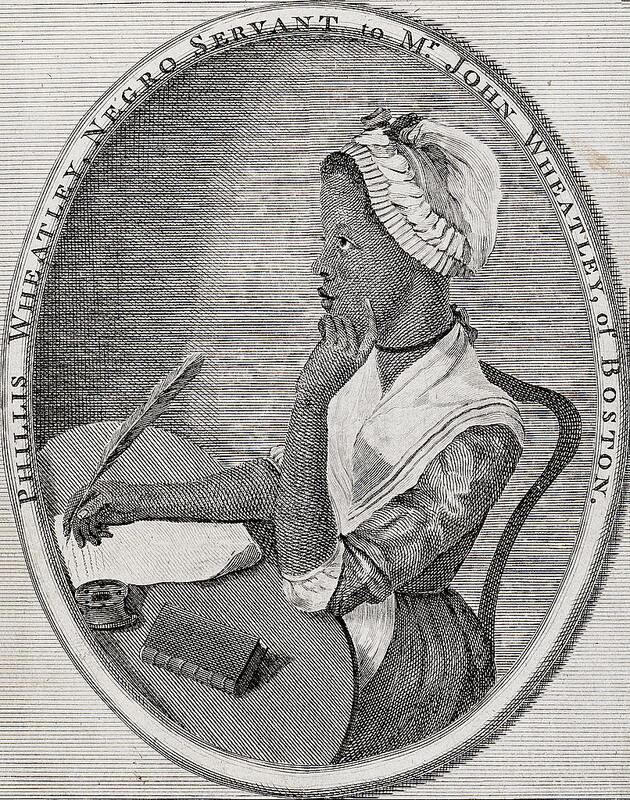 The engraved portrait of Phillis Wheatley, used as the frontispiece to her poems, Reflections on Various Subjects Religious and Moral (London, 1773), is attributed to the poet and visual artist Scipio Moorhead, a slave in Boston, Massachusetts, and a friend of Phillis Wheatley. One element of the identification of the portrait as Wheatley might have been a mention of the subject’s finger held to her cheek. This engraving has been copied many times. Phillis's poems were about learning and virtue, patriotism, battles, and the greatness of America, but she was reluctant to write about slavery. One poem was about George Washington, then the leader of the Patriot Army, which she read to him in person. Although she had the freedom to write poetry, recited it in many places, and became well known, Wheatley was still a slave. All the money she earned went to the Wheatley estate. When John Wheatley died in 1778, five years before the state of Massachusetts outlawed slavery, his will provided for giving Phillis her freedom. After they married, Peters and his new wife moved to Wilmington, Massachusetts, but due to the economics after the war, it was difficult for blacks to compete for jobs. Phillis continued writing and still communicated with certain famous people, including George Washington, but circumstances worked against her. They sank into poverty and debt, and lived in poor conditions. Sources vary regarding their offspring. One indicated she lost two children. In 1784, John Peters landed in debtor’s prison and while he was still there, Phillis Wheatley died in childbirth at the age of 31. Her last surviving child died shortly afterward. Phillis Wheatley’s “life as a freed woman became emblematic of the experiences of freed people of color in the early republic. Though she was able to marry a free black grocer, John Peters, she struggled to make a living as a poetess. In many ways, Phillis’s story is both unique and ordinary. Not many African slaves left written records of their experiences in the colonies, and even less had the opportunity to become published poets. This woman should be an American icon, and I don’t believe she is even mentioned in history courses. Fortunately, she is not forgotten, only lesser-known to the American public than she should be..